It is essentially a salad which is made of cucumber, mango, bean sprouts, banana flower, turnip, ginger and my personal favorite, pineapple. There are many versions of it and more fruits are added to increase the taste. Salt, lemon juice and chillies are the seasonings but the main dressing is of crushed and roasted peanuts. I call it – salad with a twist as salty, tangy and sweet flavors are combined to give zing to your taste buds. This light and fluffy dish can be best described as remix of paratha and butter naan. It looks tasty and fulfilling at the same time. I think I won’t have to search for any other main course item after having one or two of roti prata. I read that it is served best with a hot cup of beverage and that makes it a perfect breakfast option for me. I am a huge fan of chinese food and this dish is super tempting to me. Though this is not exactly Chinese but it has all the flavors a punjabi in me seeks – spice, color, aroma and taste. It is served with ketchup, just like the way we Indians like to eat. The array of vegetables in it makes sure that it has taste and nutrients in it. Now who doesn’t like a bowl of ice cream? While I was searching for dessert, I found Ice Kachang and Faluda kulfi came to my mind. Though former is better as it has a variety of sweet syrups on ice with jelly, sweet corn, red beans and a layer of condensed milk. A perfect concoction of sweet and bland. Even the description is mouthwatering. This is best to beat the heat while exploring the city during the day. Goreng Pisang is basically sweet banana fritters but these days it has been given a nice makeover. Now ice cream and other toppings like cinnamon and icing sugar is added to make this plain snack and whole meal in itself. Since I love eating both ice cream and banana chips, this one is on top of my list of foods I want to try in Singapore. It is just a small list of things I loved from the many you get there. And if any of you is planning a trip to Singapore, do make a list of food to try, in addition to the normal itinerary. If you are a vegetarian, don’t pack food with you. Write these names and search from hundreds of vegetarian options available there and savor them. 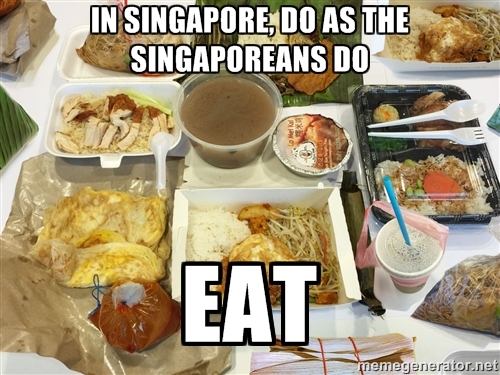 So, next time when you are in Singapore, do as they Singaporeans do and eat like Singaporeans eat. Next > What is our Purpose in Life? All the dishes looked tempting but the sight of Roti Paratha was mouth watering. In fact, I think they call it Malaysian Paratha here in the US if I am not wrong and it is so delicious. I have not come across it. The ones I have seen here look nothing like the picture in your blog. That was really sumptuous. Try Indian grocers and ask them about Malaysian paratha. They maybe available in Boston, but I don’t think it’s here in Houston. Alok, Nice of you to have picked up vegetarian fare. We almost feel like a forbidden lot whenever we travel abroad with our vegetarian preferences. These days being vegetarian seems to be a sin to many. Now we know what to eat when we are in Singapore. Yes, absolutely. Sometimes we can’t even stay in small yet beautiful towns because they don’t even have Pizza outlets. And carrying our own stuff on long trips is difficult. Thank you for your inputs, Katie. Aha! I am a vegetarian too 🙂 so loved this post! Yes, they are. Thanks buddy. You got my mouth to water! Wow. but thanks for sharing,being a vegetarian myself, now i know what to order if i ever chance upon Singapore. Yes, absolutely. Being a vegetarian, we often have to wander around a bit…but might not have to do so in Singapore. Even I didn’t know about all this until I did research on Singapore. Everything looks delicious! I want to eat now. I really appreciate very useful information about eating while traveling away from home. Things have changed with globalization. You get vegetarian food almost everywhere. I was in Singapore in 1976 and there were very few choices for vegetarians.. I could find only one in Sarengoon street. It was there even in 1984 when I revisited Singapore. However, there was nothing in Jakarta and Bandung during those days, I have to live only with fruits and bread and butter/jam only. Well, we traveled to so many countries and managed with Pizza those days but now things have changed. thanks for sharing the information. look forward to have more.. Correct, we have come a long way and vegetarian food is available in almost every country now. We normally have pizza when we go out since we like it a lot, but few more options are also there like Chalupas, Burritos etc. Loved the fact that these are vegetarian dishes. I was expecting snakes & frogs :)) !! I agree with the comments here that being vegetarian is sometimes looked down upon by non-veggies and life is difficult for vegetarians in foreign countries when it comes to food. Thanks for this list Alok. With so much tourism these days things are changing, so it won’t be an issue to find Veggie stuff anywhere though options might still be limited. Oh, reading this has been a culinary adventure. Thank you for a gorgeous and delicious post! Pleasure reading your comment. You’re welcome! The dishes look delicious and it’s great to see vegetarian recipes. It looks really great, yum yum. While looking at the pictures, my stomach started growling. What wonderful fare! That’s a good one, Ankur. I guess you have lived in Singapore, is it so? I would make a good Singaporean as I love to eat! The Chinese Rojak sounds like my kind of salad. Did you take all these photos? The food looks so scrumptious. And all vegetarian – that’s great. Great post!!!!! These photos are not mine…normally I would. The sources are mentioned in the end. The food options are indeed great. Thank you, SD! Ooops – I didn’t look at the credits at the end. Great post. Makes me hungry. Makes me want to travel. 😊 you should go to Singapore sometime, you would love it! I should!!!! My brother lives there on and off. Thank you so much for these wonderful options…looks like you are well aware of Singapore and its cuisines. Yep. Did you goon your holiday yet? This is an informative post. I visited Singapore last year, and was staying in a hotel near Arab Street in Jalang Pinang. There were plenty of eateries there (most Halal restaurants there are run by Malaysian Tamils, I suppose) that served parota – which is essentially a flaky south-indian version of the paratha. They have a variant with egg too, which is yummy. We also found this super cute Indonesian restaurant just down the road, and had lovely breakfast at Artistry cafe, right next to our hotel, and Pie Face in Bugis. Ah, your post has opened the floodgates of Singapore food memories! So glad to know you experiences from Singapore. I have not been there yet, but hope I can enjoy the delicacies there sometime. And I have heard it is a beautiful country too. 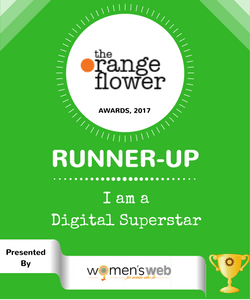 Congrats for winning the Contest. Very happy for you. Keep Blogging.